Many readers of Up Our Street will be one of thousands of local people living in private rented housing. Sadly some will have a troubling story to tell of poor quality housing, high rents and being left in a vulnerable situation by landlords more interested in profit than providing homes. Over the past two years a group of people who were concerned about the need for housing and the unfair power relationship between landlords and tenants, got together to see what they could do about it. We met Redfield resident David Mowat, who told us more about Abolish Empty Office Buildings (AEOB) and its plans for the future. “Our interest is in helping those who are living in vulnerable private rented housing and who want to live in a social housing community. Our model is a cooperative where we raise the money to buy and renovate a property which is then rented out at a fair rate” explains David. In 2014, AEOB raised the funds to buy a building on Battens Lane in St George. 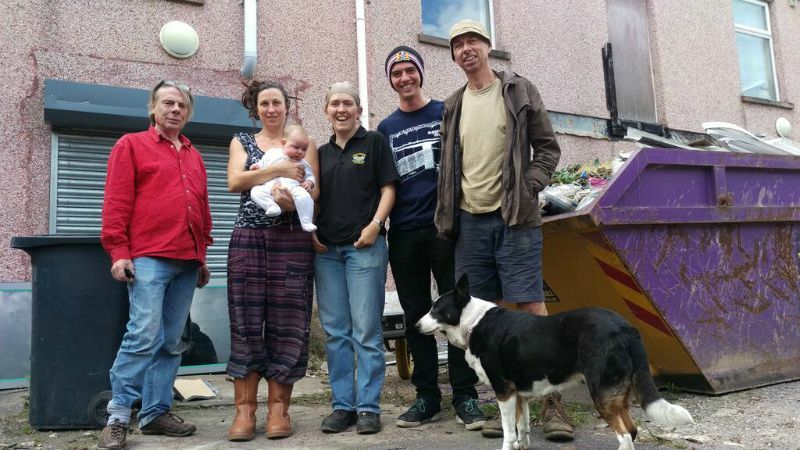 They sold investment shares from £50 or more and secured a loan from Triodos bank. 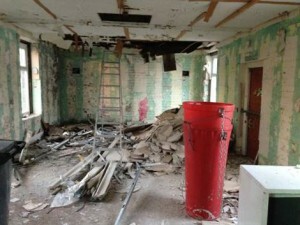 They currently have around £270,000 and need to raise a further £130,000 for refurbishment. “We have an investor who will match £400,000 and the full development will cost about £900,000 so that’s our target. This is an opportunity for anyone with an interest in social justice and some spare cash to contribute to making this project work” says David. Battens Lane will become six flats with a shared laundry, community room and garages which can be used as creative or workshop space. The concept of living in a cooperative is much more common on the continent and David thinks that we could achieve a lot by creating more of these communities in the UK. “Lots of people have limited resources or need huge mortgages to buy a home. Exciting times on the project – our Community work force have done a great job over the last months, stripped the building and set out the building dimensions with a second hand theodolite off eBay (part of ‘upskilling’ our workforce). They also set up the welfare and storage facilities making use of the old garages on site, all with materials recycled out of the old building. Contractors were selected by a tendering process run by our small team. Contractors installed scaffolding on 6th November, and Archway Construction have already made new window and door openings in the thick stone and old brick walls. 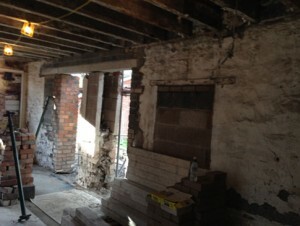 In the picture, you can see that we re-finished some of the walls with bricks taken from the demolition. 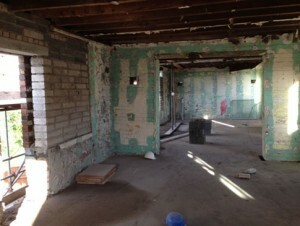 These areas will be visible in the final building intentionally showing some of its history. Our share offer is still open and we need your investment to continue this good work! Today AEOB achieved financial closure of the Triodos Bank facility. This landmark enables us to proceed with placing contracts for the major build work and get on track to turn this building over to tenants in a year. Our potential residents are delighted that we have now a live project with an end date, and affordable, low energy accommodation at the end of it. AEOB (AEOB House People Ltd) is a Community Benefit Society granted charitable status by HMRC and is a non-profit organisation. We’re on the BBC website again. Hopefully we were/will be on Points West this week. 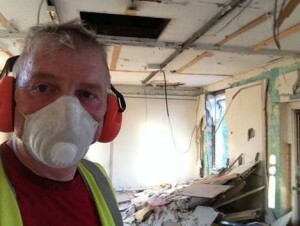 Having secured financing from Triodos Bank and engaged Solicitors to complete the transaction, we kicked off work on site with volunteer labour to empty the old offices of its contents. Many of the items left we were able to sell on EBay to help fund the charity, raising about £400 in the process. Volunteers cleared the garden and set up the garages so that we could use them as a welfare and site facility. We then stripped out the interior starting with the plumbing, radiators, electrical systems and mile upon mile of communications cable. Anything that we could re-use or recycle we have done. The garages now have electrical power and light with fittings from the old building, and we used the old kitchen units as well. At the same time we were having meetings with architects and potential contractors and developed a project plan. Now the building site for the timber frame extension has been surveyed by our own people and set out with the building profiles, ready for foundation excavation. Bristol 24/7 coverage of our project. (from left) Two of our prospective residents, Elinor Kershaw the project manager, Jono a recent graduate learning skills through working on the project, and Jim Kinnaird one of AEOB’s directors. 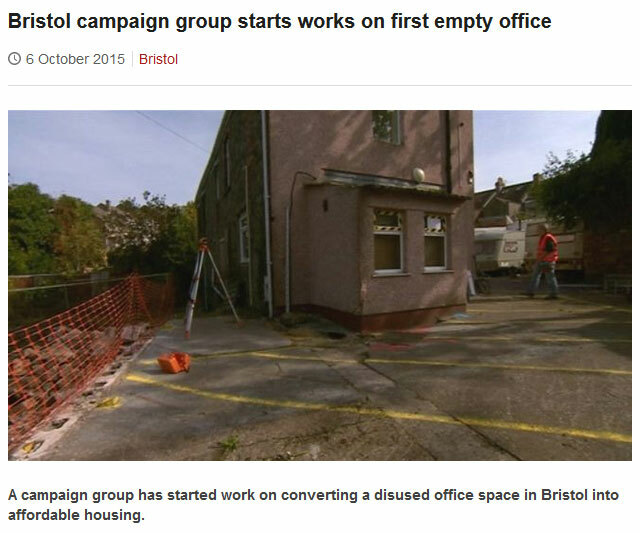 Abolish Empty Office Buildings (AEOB) will start to convert its first property to affordable housing in Bristol next month (September). The Community Benefit Society has now secured finance to commence the build. Our pioneering scheme will see the first tenants move in to secure rented accommodation before the end of 2016, with works expected to take 12-15 months. AEOB has raised nearly £300,000 from a Community Share Offer, which allowed acquisition of our first property in St George in East Bristol. Triodos Bank have now granted a £425,000 mortgage, giving the green light for full building work to begin. 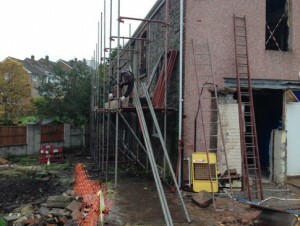 The redundant workspace will be completely refitted and extended, creating six flats which will house up to 10 people. The share offer remains open, to fund the balance of the work, and to expedite repayment of the loan. Triodos’ finance ensures completion of this project, which is intended as a demonstration of what can be achieved with empty properties. We hope it will be the first of many. AEOB is addressing the UK’s housing crisis by buying unused commercial premises and converting them into affordable rental units with secure tenancies. Each development will be owned by AEOB but managed by a tenants’ co-operative. Much of the money raised to date from our Community Share Offer came from investors in Bristol, but there have also been contributions from as far away as Scotland. AEOB founder Tony Crofts said: “We have clearly struck a chord with those who “have” and want to make an ethical investment to support those who “have not”. We are delighted to be working with Triodos UK to move this first project onward to completion”. John Cook, one of the first prospective tenants, said: “It’s nice someone’s not in it for the money”. AEOB hope to inspire others to create similar projects, and will franchise their model to other groups and other cities, who are encouraged to get in touch. Our main effort continues to be our funding campaign. 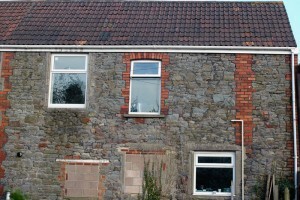 Now we have a building to develop, we need to get the remaining capital in place for the conversion as soon as possible. Our title to the property will secure a loan, and the steering group are working hard on the Business Plan, preparing to contact ethical lenders. We still need further private investment to strengthen our position when we make formal application for a loan. It is likely we will seek to match the money we have, so our current aim is to raise fifty per cent of the likely total project cost ourselves. In that connection, we will be attending the Triodos annual meeting in Bristol on June 20, so look out for the AEOB people working the room if you’re there and come and have a chat. There’ll be copies of our new leaflet in delegates’ bags, too. On site, we continue to firm up the details of the work that will be needed. The architects have been up in the roof taking measurements of the timbers which need to stay and working out how they affect the extension. Our site manager Elinor has also had a chance to look at the more detailed plans which are coming together, as well as at how the new and old parts of the building will work together, and is starting to think about the order of works with a view to weather-tightness during the build. We are also looking into who might lead on the timber frame, and have contact with some people who have experience working with community workforces. The group of prospective residents is meeting monthly and developing a core of interested people. We are starting to look into the skills available and how other skills can be developed. There’s still space for more people so we welcome contact from anyone interested in living at or working on the site. 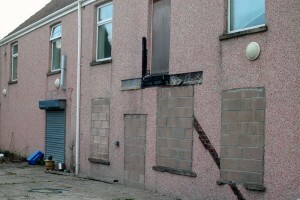 We completed a survey of the building for asbestos, and found nothing of significant risk. There are a just few pieces we should be able to remove ourselves, with care. Hurrah! We also need to remove all weeds growing inside the footprint of our planned extension. We’ll either use weedkiller or a suppression membrane for this. As clearance goes on it helps that the previous owners put a skip on the bungalow site next door. We can use this to remove the rubbish they left onsite. Save that tree! We’ve now ordered scaffold poles to support the tree protection fencing. The 6 year old planning permission we inherited calls for protection of all trees on site, but their condition has changed since the planning was submitted. The planning office are insisting we protect two trees which actually now need removing. The trees in question have been badly managed, have insufficient foliage for their size and have some severe damage, all from before we bought the site. The planning office do not have enough manpower to get someone to look at the trees again! So we have to protect them all in line with original planning conditions. Elinor completed her site management safety training – always a priority in a project like this – this month. Admin wise, we are now meeting at our archiects’ office, which gives us somewhere quiet and private to discuss work and plans.